The Certified Angus Beef ® brand is a label recognizing exceptional Angus beef that is tasty, tender and juicy. Other labels may say Angus, but that’s where the similarities end. The brand, established in 1978, is truly a stamp of exceptional quality, and your sign of a great meal. We work with family farmers and ranchers to help them raise the very best Angus beef, and monitor its progress through every stage of the journey. In fact, our bosses are in boots: Certified Angus Beef LLC is a nonprofit entity owned by the American Angus Association ® and its farmer members. Certified Angus Beef LLC is a team of beef-loving employees and we understand the beef community from farm to fork. We own the Certified Angus Beef ® brand logo, not cattle – that’s where family farmers and ranchers like these come in. In fact, the brand was created by Angus farmers to support their efforts to raise premium Angus beef, satisfying consumers while helping ensure ranching families could sustain their treasured way of life. The team behind the brand works with farmers, ranchers, packers, distributors, chefs, restaurants, grocery stores and butchers to ensure all Certified Angus Beef ® brand product exceeds your expectations. We work for you and your family’s eating experience. The Certified Angus Beef ® brand ensures incredibly flavorful, tender and juicy beef due to high amounts of marbling in every cut. Only the best of the Choice and Prime grades is considered for our premium label. Then beef must pass the brand’s 10 science-based specifications for quality. And, it’s not up to us to decide whether beef makes the cut: that’s the job of independent, unbiased U.S. Department of Agriculture graders. 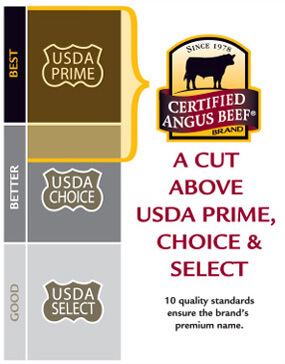 Only truly exceptional Angus beef earns the distinctive Certified Angus Beef ® brand label. We don’t just say the Certified Angus Beef ® brand is tastier than anything else you put on your plate – we back it up with fact! The integrity of the product and your satisfaction are of utmost importance to us – so we’re in the trenches. We visit ranches and work with folks who bring beef to dinner tables around the world, and rely on a one-of-a-kind tracking system to make sure you get the quality you expect from the brand at restaurants and grocery stores. You don’t have to read too many posts on our blog, GoRare.com, to realize our cattle specialists, chefs and beef experts are nearly everywhere … because we love beef, we believe in the superior taste and quality of the Certified Angus Beef ®brand, and we want you to enjoy it, too. Our Angus heritage is important to us, because Angus farmers and ranchers actually own the Certified Angus Beef ® brand, and created the vision for our high-quality beef nearly 40 years ago. In fact, ours is the only brand owned by the American Angus Association®. We encourage you to “meet” some Angus ranching families bringing high quality beef to your table. When you choose beef for your family’s table, you can feel good about the dedicated families across the beef community who work hard every day to bring you their best. It’s not just a job, but a source of pride and a treasured way of life. Ranchers, like Debbie Lyons-Blythe, take the first steps toward getting healthy cattle and quality beef to market. Feeders, like Anne Burkholder, and packing companies also play important roles in this mission. Chefs and retailers impart their own expertise to ensure you enjoy the beef on your table. Together, from farm gate to dinner plate, they ensure a plentiful supply of delicious, nutritious beef for your family, and their own families, too. Meet some of the fine folks we’re proud to work with within the beef community.